1.Click here to go to Fastticket offer page. 5.On payment gateway segment, apply the promo code of offer on right side of the page. 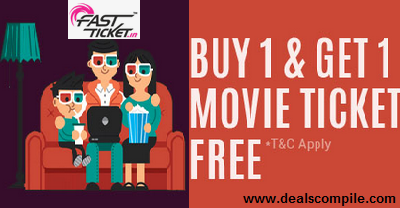 (1) This offer is valid on http://fastticket.in/. (2) Offer valid for a month only till 30th April,2015. (3) To avail offer, customer has to select minimum 2 tickets while normal ticketing process. Once promo code will be applied, 1 Ticket will be free automatically. (4) Maximum discount will be up to Rs 150. (5) Single user can use offer for single time. (7) Offer valid for the Cinemas listed in Fastticket only. (8) Fastticket and MyDala’s decision will be final and binding to all. You can also use paytm wallet to Recharge also But get cash back in Fastticket only. PayUMoney offers additional discount available on select different shopping websites like Snapdeal, ShopClues , Groupon ,goibibo ,etc.